exposing to the sun as much as possible in every case. 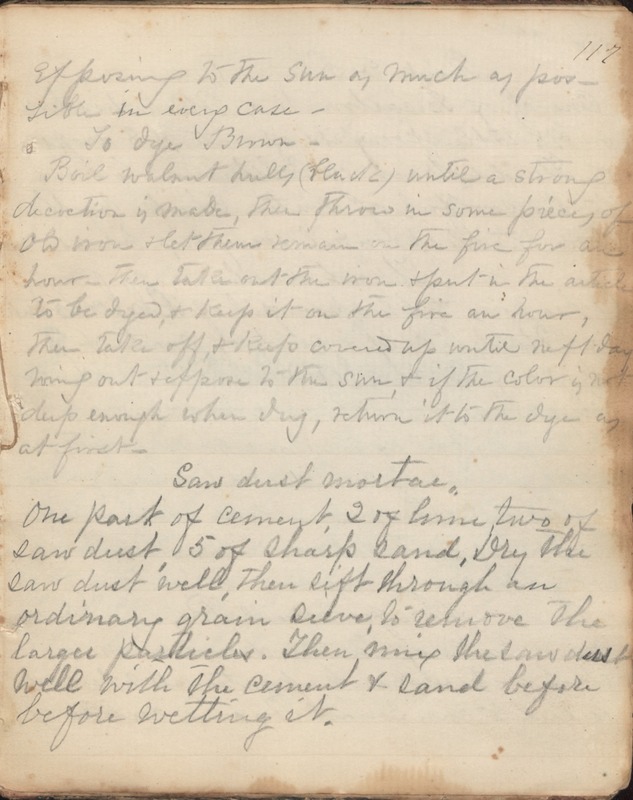 To dye Brown - Boil walnut hulls (black) until a strong decoction is made, then throw is some pieces of old iron & let them remain on the fire for an hour - then take out the iron & put in the article to be dyed, & keep it on the fire an hour, then take off, & keep covered up until next day wring out & expose to the sun, & if the color is not deep enough when dry, return it to the dye as at first - Saw dust mortar. One part of cement, 2 of lime, two of saw dust, 5 of sharp sand, Dry the saw dust well, then sift through an ordinary grain sieve, to remove the larger particles. Then mix the saw dust well with the cement & sand before before wetting it.